ODI captain Aaron Finch’s dire form is the single biggest problem facing Australia just over five months out from the World Cup in England. In his past 20 innings for Australia across all three formats, Finch has scratched out just 252 runs at 12 with only one half-century. Australia would be extremely reluctant to drop Finch due to the glaring lack of alternative captains, with Steve Smith and David Warner banned from leadership roles and co-vice captains Alex Carey and Mitch Marsh battling just to earn World Cup selection. But Finch’s form trough is so deep Australia may need to drop him if he cannot emerge from it over the five-match ODI series starting in India in just over a month from now. Regaining touch will be a tough task for Finch against India, whose quicks have toyed with him across all three formats in the past two months. Skilful swing bowler Bhuvneshwar Kumar tormented the big right-hander in the just-completed ODI series, in which he made 26 runs at eight. Meanwhile, Jasprit Bumrah hounded him in the Tests and T20s and should be back to target him in the upcoming 50-over games. Finch has been a joy for the India quicks to bowl to over those three recent series due to a technical shortcoming he cannot seem to correct. The way in which Finch’s head is falling to the off side is causing him to overbalance and means he regularly is not dispatching balls on his pads. This has meant the Indians can target his stumps without the fear of being whipped through the leg side. Finch is desperately waiting on width outside off stump but is getting none. Essentially, the Indian bowlers can safely aim their deliveries anywhere between Finch’s leg stump and 20 centimetres outside of his off stump. That is an enormous margin for error to give top international bowlers. By comparison, when quicks bowl to the likes of Virat Kohli, Kane Williamson, Steve Smith or Shikhar Dhawan, they are reticent to aim at their stumps because of how often these balls are clipped for runs through the leg side. The bowler also cannot afford to stray more than 20 centimetres outside their off stump, leaving them to try to operate in a very narrow channel. At his best, Finch routinely takes balls off the stumps and dispatches them through the leg side. If he cannot regain this touch in India next month, the accurate Indian quicks will chew him up and his World Cup campaign will surely be in jeopardy. 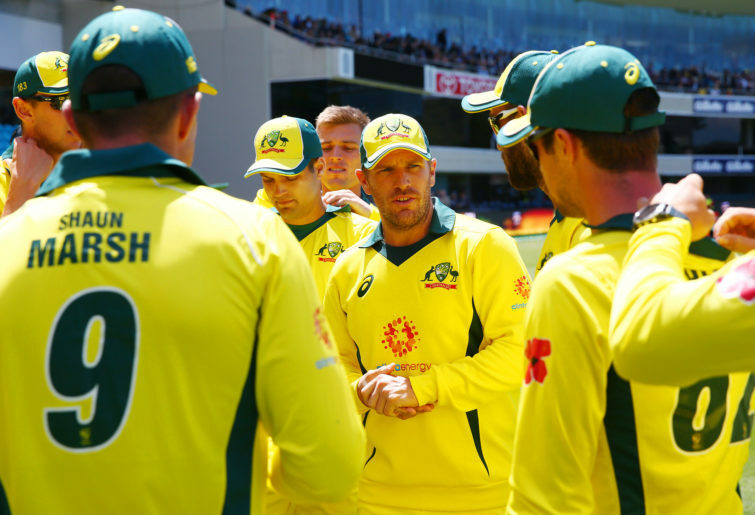 As much as Australia will be wary of changing captains just six or seven matches out from the World Cup, they also will not want to carry a desperately out-of-form opener given the overall struggles of their ODI batting line-up. Australia already face the challenge of trying to reintegrate Warner and Smith into their top order in a short amount of time prior to the tournament. If fit, both of those banned batsmen are expected to slot back into Australia’s line-up for the series against Pakistan in the UAE starting at the end of March. Australia would love to have Finch and Warner opening and in good nick for the World Cup. That pair have vast experience, having opened together in 48 ODIs. They are the fourth-most prolific opening pair for Australia in ODI history, with 2126 runs at 44, behind only Adam Gilchrist and Matt Hayden (5372 runs at 48), Gilchrist and Mark Waugh (3853 runs at 41) and Geoff Marsh and David Boon (3523 runs at 40). But Finch and Warner might not get the chance to build on that record anytime soon if the former continues to flounder in India next month.